Downloading music to your iPhone iOS 12/11/10 will allow you to listen to your songs on the go, so it’s a good idea to familiarize yourself with a few different ways that you can transfer your music. The best way is to use a third-party application, but we’ll discuss that in more detail below. A great alternative to iTunes is a third-party app called iMyFone TunesMate that gives you back control over your music. It has a few advantages over iTunes. Namely, it can transfer both specific files that you select and bulk amounts of files. It can also transfer non-purchased music as well as purchased music. Step 1: Download TunesMate. Make sure it is installed. Connect your iPhone. Step 2: Open TunesMate, and click on “Music”tab at the top menu. Step 3: Your music will populate the screen. Click on “Add > Add File” to select which songs you want to download. Click “Open” to transfer them to your iPhone. It can delete duplicate songs in bulk. You can manage and delete individual files. You can back up your music and other files. You can transfer both to and from your iPhone and PC. There is two-way transfer. You can transfer between many different devices. You can manage your playlists right from the TunesMate interface. Launch iTunes. Connect your iPhone to your computer with the USB cable. Click on “File” at the top, then choose “Add File to Library,” and locate the music files on your computer. Once selected, hit “Open” to add music to your iTunes library. Click device icon at the upper left corner on iTunes. Click on “Music” tab from the left menu. Check “Sync Music” and select the songs. Then hit “Apply” button. It only supports some specific music formats, you need to convert your songs first. 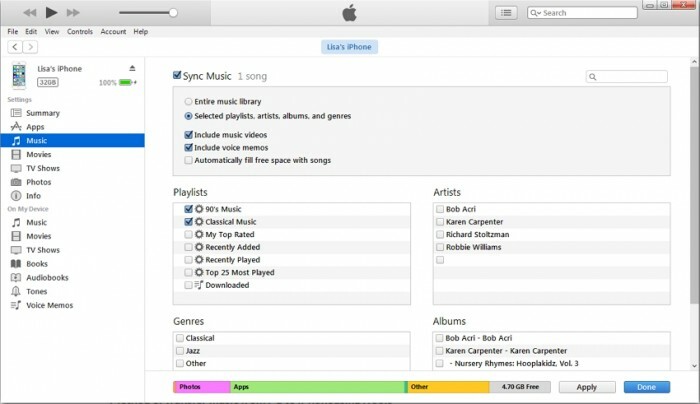 The existing songs on your iPhone will be removed once you sync. If it is the first time you sync music from this computer, all the media files on your iPhone from iTunes will be removed. iPhone is allowed to sync to one iTunes library at a time. It is not available for you if your iPhone is synced to another iTunes library. iTunes can take a long time to sync. You don’t have full control over your files. In addition, you can also use cloud services to download music to your iPhone. Use cloud services to download music to iPhone, please don’t forget to convert your music formats first. Or the added music cannot be played on iPhone. This is an app that allows you to keep your music in the cloud. It’s kind of like Dropbox, but a bit more specialized. Again the limitation here is that you have to wait to download, so you need an Internet connection, unlike with TunesMate. Also, you would be transferring music that you bought from Amazon, so using non-purchased music probably wouldn’t work. This app lets you buy music in Google Play and share it among all your devices. It suffers from similar limitations as Amazon Cloud Player. If you like Google’s store, then that’s fine, but if you need to transfer without an Internet connection or you need to transfer non-purchased files, then pick something else. This is a classic cloud service that lots of people use. You can access it from your PC via and application or just through your web browser. Anything that you upload from one device can be downloaded from another, so you can upload a file with your PC and download it to your iPhone using the Dropbox app. The real limitation is that you have to have an Internet connection to transfer, of course. Also, it takes longer to transfer because you have to wait for the file to upload from your PC, then wait again to download it to your iPhone. Go to the specific website of the cloud service, like Dropbox.com. Log in with your account. Then upload the music to cloud. Download the specific app on iPhone, like Dropbox. Login with the same account. Download the music from Dropbox to your local iPhone.